Yesterday I returned to Missouri after a wonderful week with my children in San Francisco, where we stayed with my sister and her lovely family. 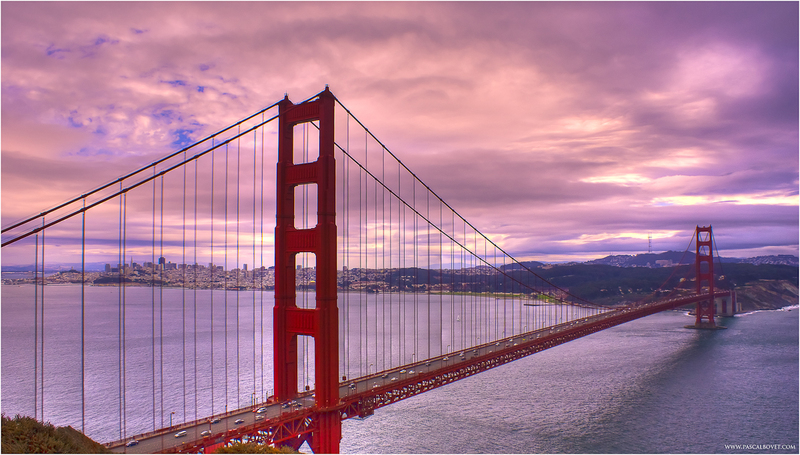 Living in mid-Missouri, going to San Francisco is, understandably, always a bit of an event. Weeks ahead of time, we raid the library for travel guides and plan what to do. This trip we went to the wonderful California Academy of Sciences, did an open-topped bus ride through the city and over the Golden Gate Bridge, and ate dim sum in Chinatown. We also went down to San Jose (I drove; no prizes for guessing what I was whistling the whole way) to see an old-fashioned circus, with clowns, dare-devil motorcycle stunts, and acrobats. More prosaically, I took my son to see the last Harry Potter film while my daughter went with her beloved older cousins to get her nails done. We had a grand old time of it, and none of us wanted the trip to end. Yesterday afternoon, on the drive back from Kansas City airport to Columbia, I asked the children what their favorite part of the vacation was. My daughter, at six, resists the concept of “favorite”. She likes to be allowed several options. I have explained that this rather defeats the whole concept, but she remains resolutely unimpressed (no doubt rightly) by my attempts to instill intellectual rigor into our discussions. I think her multi-colored (and already chipped) fingernails were a highlight, as was the gift of a battered old bunny from one of her cousins. My son enjoyed the tour bus and exploring Fisherman’s Wharf. They both liked the hour’s trampolining that we did one morning, even if everyone was extremely sore afterwards. But what was most heartening was that their responses did not center around where we had gone, or what we had done. What mattered to my children was that we had done things with my sister’s family. The children have five cousins; three live in California, two live in England. We don’t see each other as often as any of us would like, but when we do get together, it’s an immense lovefest which is far more rewarding (for parents and children) than any amount of worthy cultural excursions or entertaining trips. And this makes me very, very happy. Personally, my favorite memory of the trip was probably the most mundane one of all. It was on the first day, after we had left the California Academy of Sciences. We’d been in the museum for more than four hours and had walked through Golden Gate Park planning to hop back on to the streetcar that had taken us there. 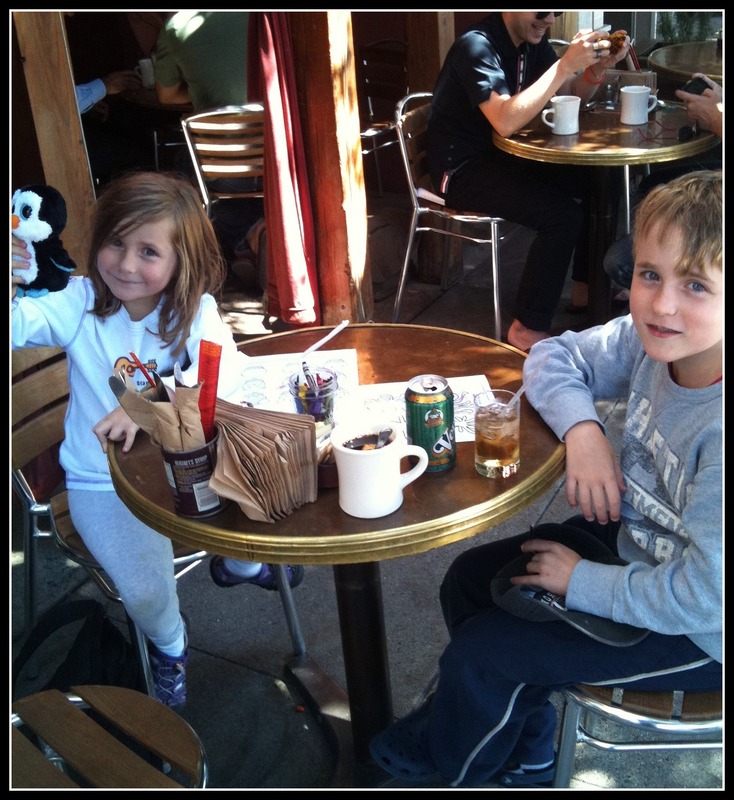 The kids and I all had a bit of museum fatigue, and as we passed a delightful-looking cafe I suggested we stopped for a rest and a little refreshment. We sat at a table on the sidewalk. It was 30 degrees cooler than it had been in Missouri and utterly blissful. While I gulped down much-needed coffee and my daughter merrily spilled her chocolate milkshake over herself, we sat back and watched the most astonishing parade of dogs go by. I have never seen so many dogs in a city. My children were in heaven – they adore hounds of all shapes and sizes. And so we sat, and drank our drinks, and enjoyed the sunshine, and cooed at the passing canine population. I could have stayed there all day. This was our first trip as a newly-minted, reconstituted family of three. And that moment – just the three of us, happy, tired, and really doing not that much – was about perfect. Who needs museums and bridges and all that stuff, when you have family? Thank you so much for sharing these memories of your trip, Alex. Oh, and I agree with your beautiful girl, it’s often impossible to choose a single favourite of anything! Alex, I really got the feel of your trip and your love of the family element. It’s often the company we have rather than what we are doing that determines the amount of enjoyment we have. Sorry you couldn’t have another week there. Terry. This is your loveliest post ever. It is so, so good to read a post like this tonight while the world seems to be falling apart all around us. It’s not falling apart at all. Thank you for sharing this lovely little spot of light. Thank you, Erika. The world does appear to be falling apart this evening – in alien, lawless London, most of all – and if it this post has helped redress the balance just a tiny bit, in a few readers’ hearts, then I’ve done a better job than I could have hoped for. Aren’t you sweet. Thank you, chicken. Oh, Terry, me too! Yes, give me good company over a magnificent view any day of the week. Memories are not made of things or places. Memories are made of people. With my family all over the world – we stretch as far as New Zealand – we have all learned to cherish and relish the rare moments we have together. Glad you enjoyed the post – thanks for commenting. Thank you, sweet Lily. I’m so glad you enjoyed the post. I know what you mean about it sometimes being difficult to choose one favourite, but Catherine doesn’t even try!!! Lovely, Alex. And your children are precious and adorable. Thank you, Cynthia! I am quite fond of ’em. What a wonderful post, Alex. You’re right; he best thing sometimes is just sitting back, taking a deep breath, being present in the moment, and taking note of what really matters. Glad you had a great time and lucky you that you escaped the Midwest’s trip to the surface of the sun! Thank you for bringing the cooler temps back with you. That was beautiful Alex. I had to wipe away a tear. Glad you are doing well!! Thank you, Hallie – yes, it was a relief to get back to Kansas City and discover that the car had not actually melted away in our absence! Strange isn’t it, how so often the most important things are right in front of us all the time, and we forget how to see ’em for what they are. I saw this post as I watched the BBC World News covering the fires all over the UK, and listened to the sorrowful economic news. Reading about you and your kids, and looking up to see my family around me, reminded me of the good that really is out there. We will weather the storm. Beautifully said, Mary. We will weather this storm. My heart is full of sorrow about what is happening in my homeland, but we cannot let a handful of amoral, destructive, opportunistic savages get us down. Funnily enough, in years to come, the children may remember the refreshment and dog moment more than the ‘bigger’ things. I have found that my strongest and fondest memories of childhood now are simple ones; long lazy summer days playing with you & B in the garden….. Family is where it’s at! Sounds like you and your children had an a wonderful, relaxing vacation! Who could ask for more?